On Monday 12 November, the German Federal Ministries of Labor and Social Affairs and of Education and Research invited representatives of the social partners and the German states to the kick-off meeting for the “National Further Education Strategy”. The Christian Democratic Union (CDU) is planning an AI-steered further education platform called “Milla”. And in the preceding week, the Ministers Peter Altmaier, Franziska Giffey, Hubertus Heil, Anja Karliczek, and Horst Seehofer jointly presented a strategy for specialist workers. The topics of securing specialist workers, New Work, and (further) education in the digital world of work are right at the top of the political agenda and also shaped the debate in the “New Work Check”, which the eco Association also organized this week: “In order to promote the digital sector and Germany’s general economic growth in the long term, today we must urgently set the course for the future. A prerequisite for this is to attract the best and brightest to, and keep them in, Germany. To achieve this, a consistent national strategy for digital education and further education is needed,” according to Oliver Süme, Chair of the Board at eco. 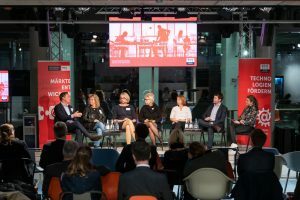 The German population has recognized the urgency of digital further education: This is the finding of a recent representative survey, carried out by the market research institute Civey on behalf of eco. Of those surveyed, 85.4% are of the opinion that, in an increasingly digitalized working world, workers will need to educate themselves considerably more (46%) or somewhat more (39.4%) than they need to today. The German population also recognizes the positive effects of the digital world of work. 49.5% of respondents of the representative eco survey stated that, in their opinion, digitalization makes reconciling family and working life easier (39%) – or even significantly easier (10.5%). All data is provided by Civey GmbH. Between 17th and 22nd October, 12,622 people took part in the survey on digital further education. 65,120 people took part in the survey on the balancing of family and working life between 20th June and 5th November 2018. The results were weighted and are representative for the German population (age 18+).